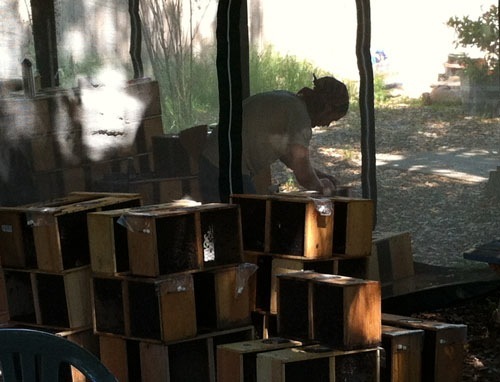 Over a couple of evenings, I prepared the hives stands for the hives. 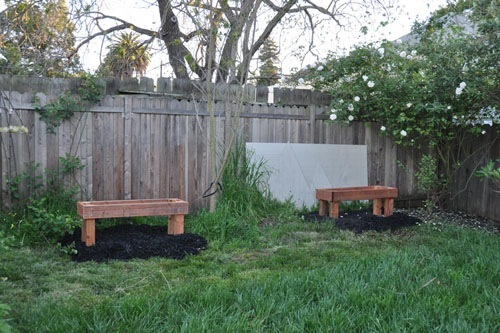 I mowed the grass very short, laid down a couple layers of cardboard (this has been a mixed strategy for me), and mulched over them. After some discussion we decided to move the brush pile that traditionally lives at the back of the yard and put one of the hives over on the other side of the Psoralea pinnata, so I did this on both sides. By last night, everything was ready to go. Then this afternoon we set out for Sebastopol to pick up the bees. 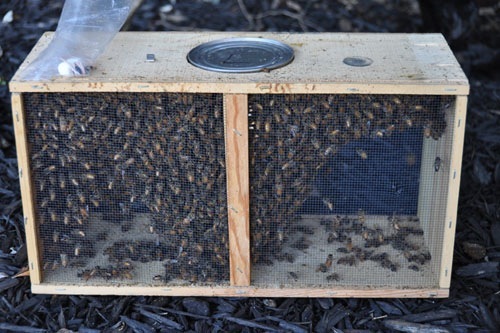 For those who don't know, package bees come in a screened box with a small inner cage for the queen (who is unrelated to the bees in the package, so she needs protecting until they get used to her). There are about three pounds of bees in the box. I've actually never installed bees from a package like this. I have caught and installed swarms, but swarming bees have a very different temperament from bees who have been swept out of a hive unwillingly. In the past I've bought bees as nucleus hives (miniature versions of a normal hive) or as a whole hive. That's generally a better way to buy bees, but this was what was available to me, and anyway, these days I don't trust anybody else's wax. I got everything set up: hive body on the stand, feeder full of sugar syrup (from the pot down there). Hive covers at hand. And this is where I draw a curtain over the proceedings, because I could not get the camera remote control to work and it was getting dark. I dumped the bees in the hives, they got rightfully pissed, and several of them tried to follow me inside the house. I'l let them sit for a few days before checking on them, but right now I'm expecting that tomorrow there will be a lot of bees still outside the hives. My verdict on installing from packages: I'm not crazy about it. 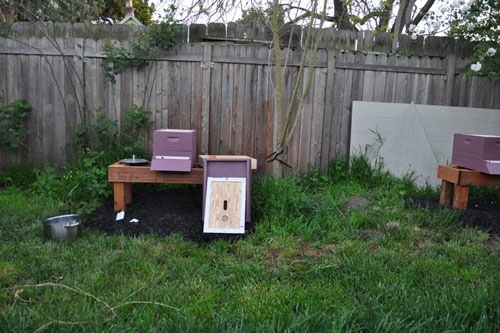 Next year I plan to start making breeder hives so I have my own supply of bees as needed. I'm installing a package in a top bar in a couple of weeks for a friend who's going to be out of town (the delivery date got pushed back). With swarms I don't fret too much, but I've never handled package bees before. They stung my gloves like crazy, but I was not stung. Definitely way more ornery than a swarm would be. What's the problem with the wax? Any pesticides or medications the bees came into contact with will be in the wax. It might not be an immediate and obvious problem, but it's part of my general distrust for how agriculture in this country has turned into an arm of the chemical industry. I had a hive swarm and one looks as though it's thinking about it (darn mediums). . . anyhow, I bet I could give you bees if not this year then next. Do you find they swarm more on the mediums? Interesting. Anyway, I don't need bees right away. And I'm hoping to do a couple of artificial swarms next year for reproduction. Interesting creatures those bees , very needed in agriculture and flowers good for you.You are the busiest people I know of and have put so many good things on your square of earth and home. Wish I had the energy ahem (and funds) Lol. Retired funds are less lol!